You are looking at a picture of some duck chocolate lollipops. These lollipops are made from chocolate. These lollipops are all handpainted. You may pick whatever color you would like for the them to be made in. 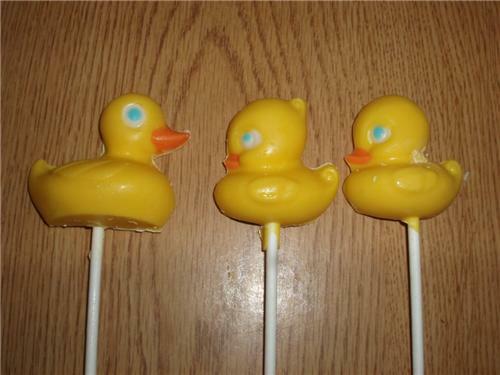 You will receive 5 duck lollipops, 2 of the bigger duck and 3 of the smaller duck. This candy is made fresh to order and comes individually bagged and tied with a pretty colored ribbon. These would be very cute for a baby shower, or for a birthday party as party favors. Rubber Duckie Party Plates 8 pk 7 in. Rubber Duckie Party Plates 8 pk 9 in.